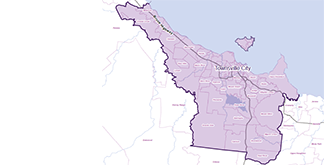 This map shows the area around Townsville that is subject to the varroa prevention and control program. Download the information sheet (link at bottom of text) for more map details. Biosecurity Queensland is conducting surveillance and control activities to detect and destroy Asian honey bees and eradicate varroa mites. To stop the spread of varroa mites, a Prevention and Control Program is now in place for the Townsville City Council local government area. The Prevention and Control Program imposes obligations on an occupier of a place where managed hives are kept. Anyone wanting to move live bees, bee hives, or any other item that may contain live bees out of the Townsville City Council area will need to notify Biosecurity Queensland by email at [email protected] at least seven (7) days prior to the intended movement. Anyone moving live bees through the Townsville City Council area, that have originated outside the area, must ensure the bees are packaged and sealed in a manner that prevents the escape of live bees while they transit through the area. Asian honey bee nests can be found in tree hollows, in cavities in buildings and in letterboxes and garden sheds. Asian honey bees are smaller and less furry than the European honey bee and have more pronounced brown and yellow stripes. Please report sightings of suspected Asian honey bees, feral nests or hives showing symptoms of exotic pests to Biosecurity Queensland on 13 25 23.